No matter how strong your nationalistic tendencies it’s almost impossible to argue against the fact that Italy has produced the world’s greatest artists. Not just the likes of Michelangelo and Caravaggio but polymaths Da Vinci and Galileo who were experts in so many areas it’s impossible to count. What these men also possessed was an unmistakable madness and willingness to transgress society’s norms that are qualities our modern renaissance men of Anvil Motociclette not only share but are deeply proud of. So it should come as no surprise that San Marco and Phonz found their inspiration for this build in an immense and dusty abandoned factory that serves as a mausoleum for a century old motodrome. 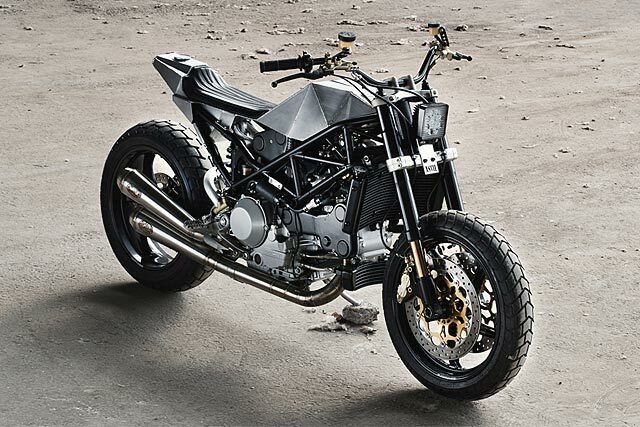 It’s rolling art with superbike levels of performance, a Ducati Monster S4R that now goes by the name WARTHOG Mille.